Andrew Chi-Chih Yao (Chinese: 姚期智; pinyin: Yáo Qīzhì; born December 24, 1946) is a Chinese computer scientist and computational theorist. He is currently a Professor and the Dean of Institute for Interdisciplinary Information Sciences (IIIS) at Tsinghua University. Yao used the minimax theorem to prove what is now known as Yao's Principle. Yao became a naturalized U.S. citizen, and worked for many years in the U.S., but in 2015 he renounced his U.S. citizenship and became an academician of the Chinese Academy of Sciences. Yao was born in Shanghai, China. He completed his undergraduate education in physics at the National Taiwan University, before completing a Doctor of Philosophy in physics at Harvard University in 1972, and then a second PhD in computer science from the University of Illinois at Urbana–Champaign in 1975. He was an assistant professor at MIT (1975–1976), assistant professor at Stanford University (1976–1981), and professor at the University of California, Berkeley (1981–1982). From 1982 to 1986, he was a full professor at Stanford University. From 1986 to 2004, he was the William and Edna Macaleer Professor of Engineering and Applied Science at Princeton University, where he continued to work on algorithms and complexity. In 2004, he became a Professor of the Center for Advanced Study, Tsinghua University (CASTU) and the Director of the Institute for Theoretical Computer Science (ITCS), Tsinghua University in Beijing. Since 2010, he has served as the Dean of Institute for Interdisciplinary Information Sciences (IIIS) in Tsinghua University. He is also the Distinguished Professor-at-Large in the Chinese University of Hong Kong. In 1996 he was awarded the Knuth Prize. He received the Turing Award, the most prestigious award in computer science, in 2000, "in recognition of his fundamental contributions to the theory of computation, including the complexity-based theory of pseudorandom number generation, cryptography, and communication complexity". He is a member of U.S. National Academy of Sciences, a fellow of the American Academy of Arts and Sciences, a fellow of the American Association for the Advancement of Science, a fellow of the Association for Computing Machinery, and an academician of Chinese Academy of Sciences. 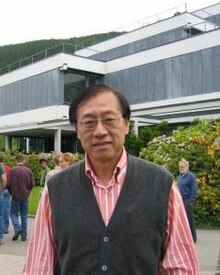 His wife, Frances Yao, is also a theoretical computer scientist. ^ a b "Andrew C Yao – A.M. Turing Award Winner". amturing.acm.org. Retrieved 2016-06-12. ^ "YaoTree". infolab.stanford.edu. Retrieved 2016-06-12. ^ "Andrew Yao". www.cs.princeton.edu. Archived from the original on 2016-08-08. Retrieved 2016-06-12. ^ "ITCSC People". www.itcsc.cuhk.edu.hk. Archived from the original on 2016-10-08. Retrieved 2016-06-12. ^ "ACM Fellows–1995". acm.org. Retrieved 10 March 2015. Wikimedia Commons has media related to Andrew Yao. This page was last edited on 14 March 2019, at 09:39 (UTC).